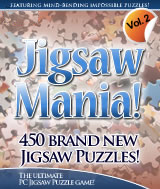 Jigsaw Mania Volume 2 features 450 brand new, beautiful jigsaw puzzles including mind-bending ´Impossible´ puzzles designed to put your puzzle-solving skills to the test. Jigsaw Mania also creates puzzles easily from any of your pictures with a wide range of options, such as altering the number of pieces and changing the piece shape and size. Share your love of puzzles with friends and family. Everyone can find something to love in Jigsaw Mania Volume 2. Comments: Excellent puzzles, shapes, and quality of pieces. Keeps me enyertained for hours. My favorite game!